Bedworks tries to keep most items in stock. Pick-ups can be immediate. Everything we offer comes boxed or plastic wrapped, but you don't! It's no fun to get wet or slip on ice and snow if you have options. So before you come in to pick up your furniture, check the weather. If you live nearby, we have many options for getting your furniture home. It's amazingly easy and fast to pick up your purchase! Bedworks' beds and futons come in easy-to-carry components. Nothing weighs more than 75 lbs. With our workshop's convenient side-door Green Street legal loading zone, we can load your purchase in five minutes. With any four-door car, our double and queen futon mattresses fit in the backseat. 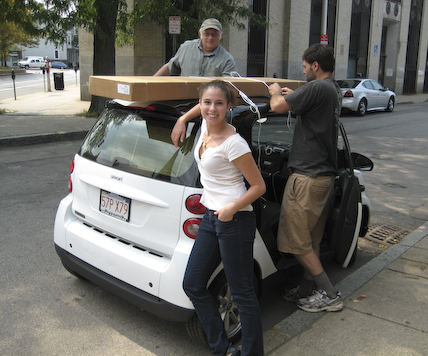 Longer items like platform beds and futon frames fit in hatchbacks and lash down tight on car roofs. We supply the rope and tie it down. Our knot-expert woodworkers guarantee everything is secure. Assembling your furniture at home is easy. Everything bolts together in 30-40 mins, with only the allen wrench that we give you, a phillips-head screw driver and a good buddy. 2) Don't have a car? We call a cab to our loading zone. 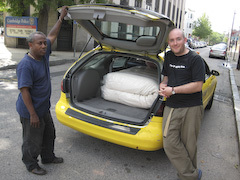 We load your futon mattress in the back seat, you hop in the front seat, and you're home in minutes for just cab fare. This way, you can sleep on your futon tonight and never waste hours waiting for more delivery men who don't show up. If you're getting a platform bed and futon frame set, we call a station-wagon cab. This stretch cab takes you and your furniture home for six dollars, plus standard cab fare. Hundreds of Bedworks' customers can attest a cab is the fastest solution. You'll be home with your bed in minutes! 3) Have a friend with a car? 4) Or walk 20 feet and rent a Zipcar! Zipcar's lot is right next door. 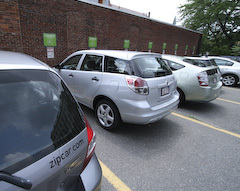 Zipcar works great, especially if you need a car for other things too. 5) Live only a couple blocks away? We'll loan you our hand truck, and strap your mattress and frame tight. Wheel everything home in a jiffy! 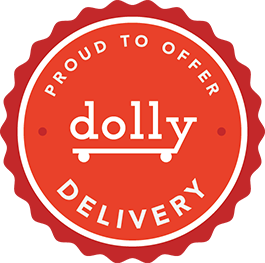 Dolly - Like Uber with a pick-up truck. Let Dolly's pick-up truck take you home with your Bedworks purchase! Prices starting as low as $60 for deliveries to Allston, Back Bay, Brookline, Cambridge, Somerville and Watertown. Download the app today. 7) Delivery w/our Outside Furniture Delivery Company, N.E.D. Local deliveries usually take only a few days. N.E.D. 's dispatcher phones you to set up a delivery day and time window that works for both of your schedules. What are you having delivered and assembled? Where is your room located? You can order our designs anywhere in the continental U.S. and have them delivered in 4 to 6 weeks. Our professional White Glove delivery service has 20 years of experience. They deliver our handcrafted furnishings and set them up in your home just where you want them. 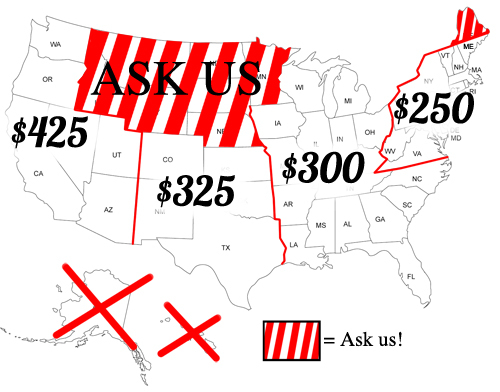 They deliver from Maine to Miami, from Seattle to San Diego, and all across the country. Wherever you are, you can sleep on a Bedworks Hand-crafted Original! "Thank you for the perfect sleep! The mattress you sold me is just perfect."